I Love this Thing (Sorry for the Blurriness, It Looked Clear on The Phone…). I’d like to introduce y’all to one of my prized possessions. This thing in the picture above is called the H.O.T.A.S.S., or Hands on Throttle and Stick Support. 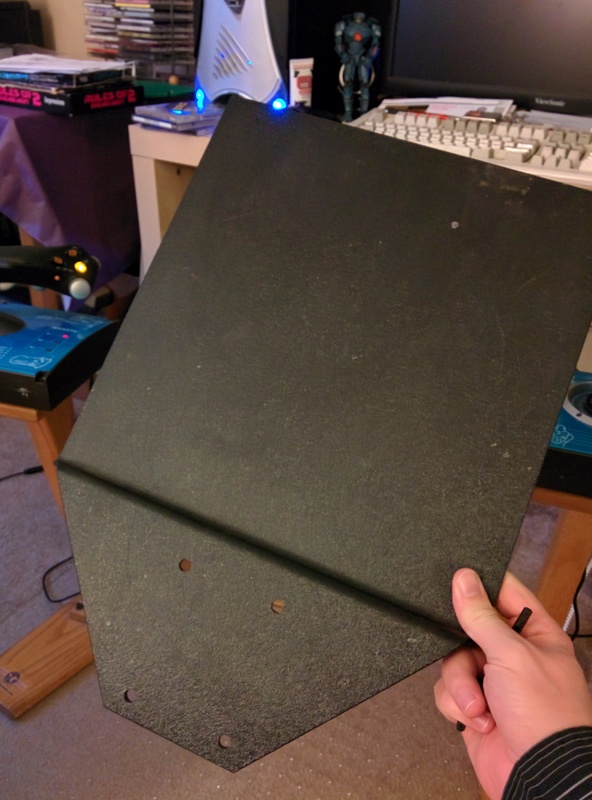 Back in the late 90s, before the temporary death of flight and space sims (that none of us saw coming), a company called Fighter Systems sent me one of these for review. The review was sadly lost to the sands of time, but the H.O.T.A.S.S. is still here and has been with me for around sixteen years now, through two moves (one of the cross-country) and three apartments. The fantastic thing about this is that it allows your HOTAS (Hands on Throttle and Stick) to be move out of the way when not in use, or not taking up valuable desk space. I freaking love the damned thing, and I wish Fighter Systems would come back to make more because I think there’d be interest these days. I mean joysticks and such are selling out thanks to Elite: Dangerous, for example, and with more sims coming, one would only hope the demand would increase. I REALLY wish I still had the contact info for the folks there, but that too was lost to the sands of time. This is a foot pedal attachment that attaches to the center portion of the base (I mean, where else really?). 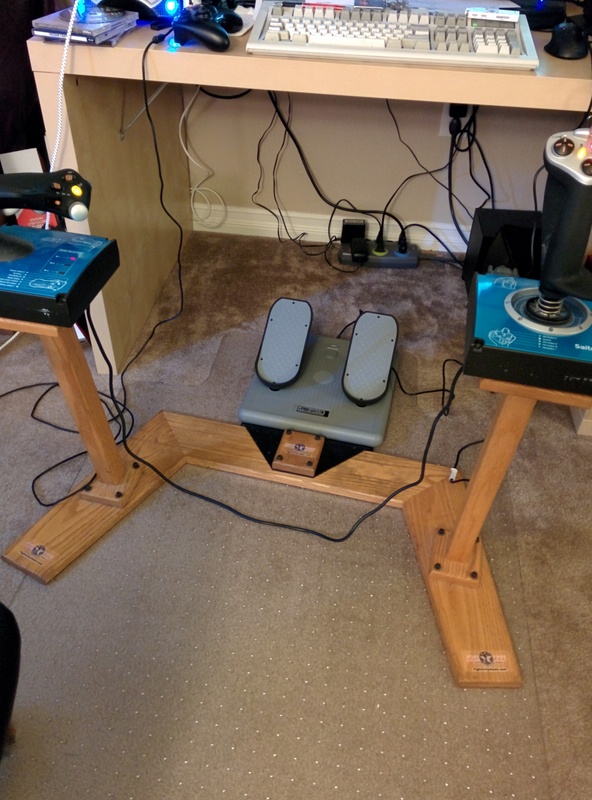 I’ve kept in in the hope that one day I would indeed get foot pedals, but because my Saitek sticks have had rudder rockers on the throttle for a while, I’ve not felt like I’ve needed a set. 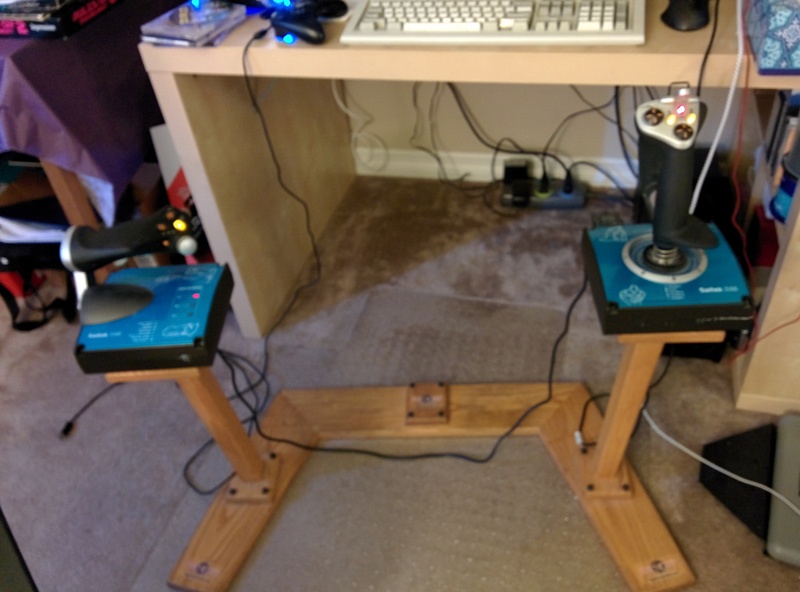 However, my awesome girlfriend and her sister pitched in and got me a set of CH Pro Pedals (I plan on going full CH once this Saitek X-45 dies) for my birthday, so now I had an excuse to use it! After buying a new allen wrench to remove the screws, along with some Velcro tape for the pedals and the base, everything was attached pretty easily peasily. So now I’ve got this full throttle, stick and rudder set up for the first time ever, and it’s WEIRD man. Like, I really have to get used to actually doing something with my legs as I play games, which is likely good for me. I really hope and pray nothing ever happens to my H.O.T.A.S.S. because I’ve no idea what I’d ever do for a replacement. I mean this thing has been through several HOTAS setups and dozens, if not hundreds of games with me, and I can barely imagine gaming without it. This thing took me through my first tour in Freespace 2, for example, along with now countless other games since then. Apologies in advance for derailing your thread about the HOTASS to talk about the HOTAS itself, minus the extra S.
Awesome. I really love my CH gear, but you’ve probably seen me post that previously either here or at GWJ. That said, you really should try to find a friend that has it and give it a try first. Everyone seems to prefer the feel & button layout of different systems. One of the best things about having a full CH setup is that you can use the CH Control Manager software to merge all your controllers into a single virtual controller and program all the functions. For some games (like E:D from what I’ve read), this is almost necessary as the games don’t like to have so many separate controllers. Also, make sure you check out the CH Hanger (http://www.ch-hangar.com/forum/), which is inhabited a few CH veterans. It is not an official site, although CH employees do use the forum. Hey man, good to see ya. To address your concern, I had a ganeport version of the flightstick/fighterstick years ago and loved it. I’ve also had hands on time with the throttle, so I’m already aware I’ll love it. ;) The software tip is veeeeery handy though, especially for E:D. Thanks!! Glad to hear that you’ve already taken the kit for a test drive. If you ever do get it, post on GWJ because a few of us there can help you with our bindings & programming for E: D.
Did you ever have any luck getting hold of that guy who was selling the blueprints a few years back? No more issues with the stick being too high like it was on the desk I used before. Elite: Dangerous is fantastic with HOTAS controls. Hey Brian thanks again for the nice review ..
OMG RICK! HI! I NEVER THOUGHT I’D TALK TO YOU AGAIN! I’ll be email you toot sweet! If anyone were ever to reverse engineer this, I would buy one instantly. I purchased the HOTASS back in 1999. I still have it still use it and still love it! I would love the plans to add the RPI to it. Rick could sell the plans for like 5 bucks and make some money. Next story Flailing About in Sector 13 with the Developers!